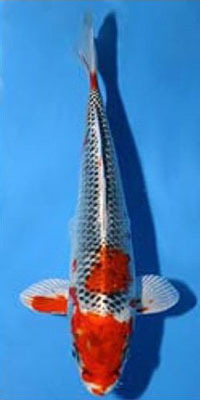 This class covers all other metallic koi (two or more colors) that do not fit in Hikarimuji or Hikariutsuri categories. It is an ever-growing category of metallic koi with beautiful patterns. - Kujaku: platinum koi with with metallic-orange pattern, the scales being overlaid with a Matsuba "pinecone" pattern. - Doitsu Kujaku: Kujaku with Doitsu scalation. - Platinum Kohaku: a cross between Kohaku and Platinum Ogon, it is a Kohaku with a platinum base. - Kinsui and Ginsui: metallic Shusui. The ones golden/red are called Kinsui and the silvery ones - Ginsui. - Shochikubai: metallic Ai Goromo. - Beni Kujaku: Kujaku with red markings. - Sakura Ogon: metallic Kohaku (Hariwake) with a red pattern. - Tora Ogon: golden-metallic Ki Bekko. - Yamabuki Hariwake: bright golden Ogon pattern on a platinum body. - Orenji Hariwake: orange Ogon pattern on a platinum body. - Hariwake Matsuba: a silver and dark-gold koi with "pinecone" pattern. - Yamabuki Hariwake Matsuba: same, with a bright-golden colour. - Doitsu Yamabuki Hariwake: silver and gold with Doitsu scalation. - Doitsu Orenji Hariwake: silver and orange with Doitsu scalation. Koi with two metallic colors like Platinum and red. Koi in this class include Platinum Kohaku, Gin Bekko, Yamabuki Hariwake (yellow and Platinum), Kikisui (literally Water chrysanthemum Platinum Kohaku with wavy red lines on both sides) and Orenji Hariwake (orange and Platinum). Also included with two metallic colors plus black are Kujaku (Platinum Hariwake with black pine cone pattern), Doitsu Kujaku, Yamatonsihiki (metallic Sanke), Tora Ogon (Tiger koi actually a gold metallic Ki Bekko), Hariwake Matsuba (Platinum Hariwake with black reticulation). Metallic Shusui are called Kinsui and Ginsui with the former having more red markings. Shochikubai are metallic Ai Goromo. Hikarimono which have two or more coloured patterns one of them which is metallic, except for the Hikari Utsurimono, are grouped in the Hikari-moyomono. 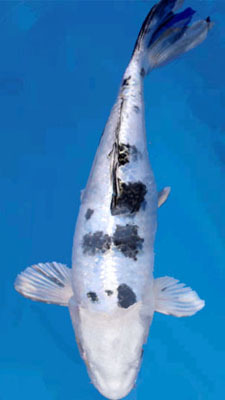 The Hikari-moyomono are divided broadly into two categories, that is, koi with coloured patterns over a metallic base, and the koi with two metallic colours. 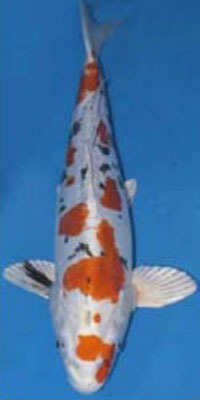 The former are koi produced by crossbreeding Ogon with any of the other varieties except the Utsurimono. Platinum Kohaku, Yamatonishiki, Kinsui, Ginsui, Shochikubai, Kujaku Ogon, Kujaku Doitsu, Sakura Ogon, Kin-zakura, Gin Bekko, Tora Ogon, and Momiji Ogon belong to this type. The latter have two colours, one of which is platinum. Yamabuki Hariwake, Orange Hariwake, and Hariwake Matsuba are in this group. Hikari-moyomono of Doitsu lineage include the Yamabuki Hariwake Doitsu, Orange Hariwake Doitsu, Hariwake Matsuba Doitsu, Kikusui and Hyakunen-zakura. The Yamato-nishiki are the Hikarimono of the Taisho Sanshoku. These days many excellent Yamato-nishiki with a platinum sheen, dark Hi, and clear Sumi are found. The "Kujaku ( peacock )", are characterized by an elegant two metallic coloured ( platinum and Hi ) pattern over which the attractive Matsuba pattern is laid, making them gorgeous, The best ones have bright head Hi. Kujaku Ogon which have red markings all over the body are called "Beni (red ) Kujaku", are highly esteemed as unique koi. There are Doitsu Kujaku, and some beginners mistake them for Kinsui and Ginsui. They are the Hikarimono of the Shusui, therefore the Hi appears quite different from that of the Kujaku. The Kujaku Doitsu have scales over which the Hi spreads. The Platinum Kohaku, also called "Kin-fuji", are the Hikarimono of the Kohaku and Platinum Ogon. The platinum head should be completely free of Hi, while the body Hi should be scarlet. 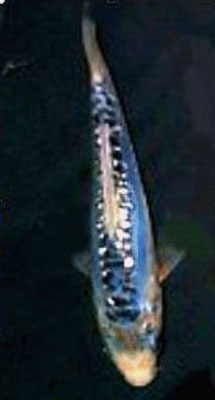 The "Kikusui" are Doitsu Platinum Kohaku. "Shochikubai" are the Hikarimono of the Ai-goromo, and have blue V-shaped markings. "Gin Bekko" are hybrids of the Shiro Bekko, and Platinum Ogon, with patterns resembling those of the former. "Tora Ogon" are the Hikarimono of the Ki Bekko, having black markings on a metallic-golden back. "Momiji Ogon" are rare, gorgeous koi with red, purple, and white colours. Hariwake, which have two metallic colours, can be roughly divided into four groups---the “Japanese” fully-scaled, Doitsu, Matsuba and Matsuba Doitsu Hariwake. Some have very distinct golden and silver patterns which generally make their value high. The head should preferably be beautifully bald, the scale borders shown in relief, and the patterns well balanced. Fully-scaled Hariwake include the "Yamabuki Hariwake" with Yamabuki ( bright yellow ) Ogon patterns on a platinum body, and the "Orange Hariwake" with Orange Ogon patterns instead of yellow. The "Hariwake Doitsu", "Yamabuki Hariwake Doitsu", and "Orange Hariwaki Doitsu" all require neatly aligned scales. If they have large scattered scales or scales overlapping one another at random, they will be regarded as worthless. "Yamabuki" or "Orange Hariwake Doitsu which have wavy, broken patterns on both sides are known as “Kikusui” ( Water chrysanthemum ). A Kikusui with a clear platinum head and well balanced pattern is a superb koi. Those with especially brilliant dorsal scale edges are rarely found. 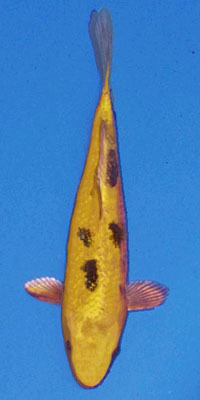 Hariwake of the Matsuba-goi line, are "Hariwake Matsuba" with a dark golden colour and "Yamabuki Hariwake Matsuba" with a bright yellow golden colour. There are also Doitsu lines of these types known as "Hariwake Matsuba Doitsu". In all cases, the Matsuba Sumi over the two metallic coloured patterns should be deep and clear, plus in the fully scaled koi, the reticular pattern should be sharply defined.